Travelling for a long period inevitably leads to these moments when one needs to slow down, to put down one’s backpack for a while. 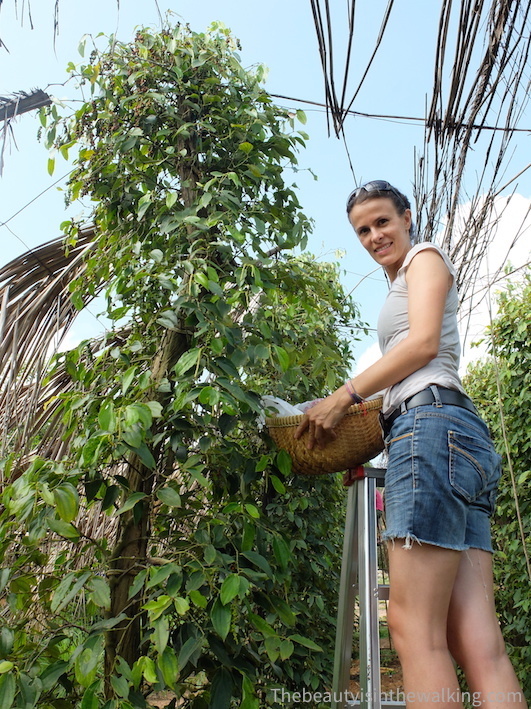 That is exactly what we did at the Sothy’s Pepper Farm, an organic farm that produces the famous Kampot pepper. 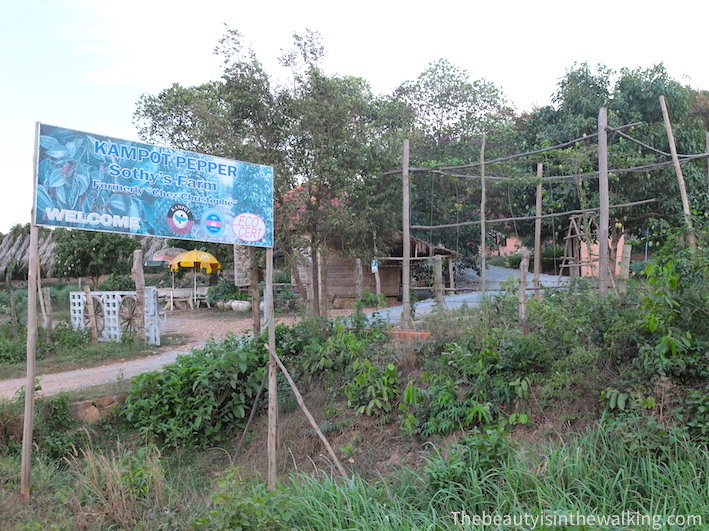 It is situated at about 20 km from Kep, a small town east of the Cambodian coast. What we were looking for was to volunteer – i.e. 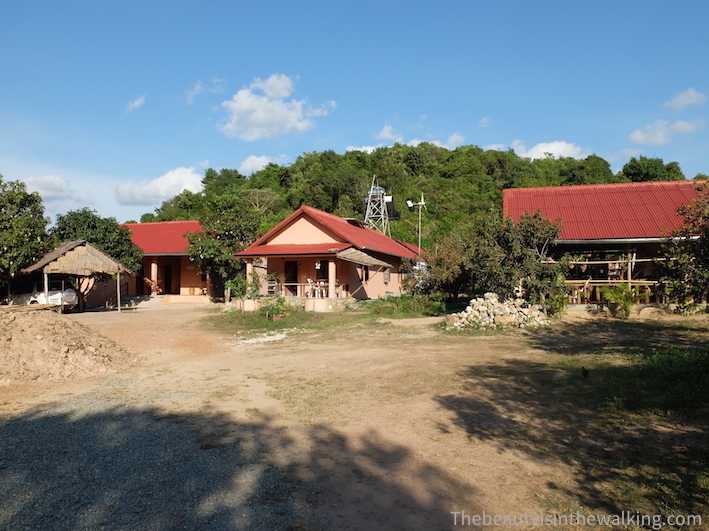 help in exchange for free food and accommodation –, in a beautiful place, within a structure that embraces a certain ethic – here, organic agriculture – and where we could also learn new things. 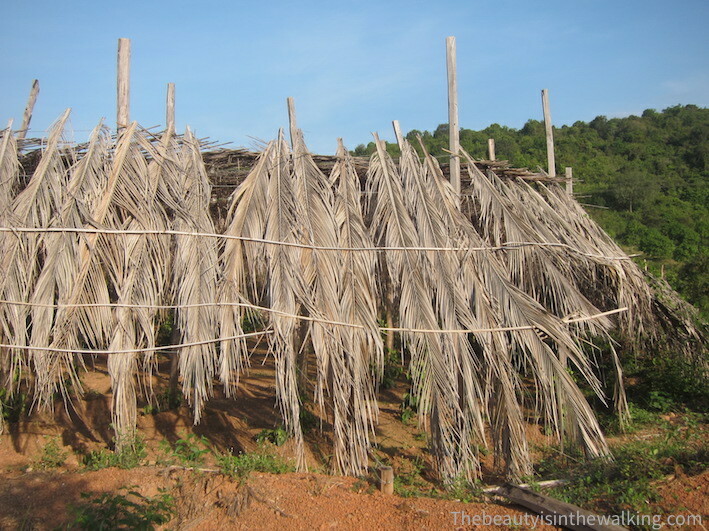 On Helpx.net, a web site that puts in touch volunteers and structures that need help for about 20 US dollars for two years, we came across Sothy’s advertisement, (Sothy has been owning the farm for two years). Then, the rule is simple: we contact the host to know if we can come and help and when, list some skills and know-how that we can provide during our stay and wait for an answer. Fortunately, Sothy accepted straightaway. 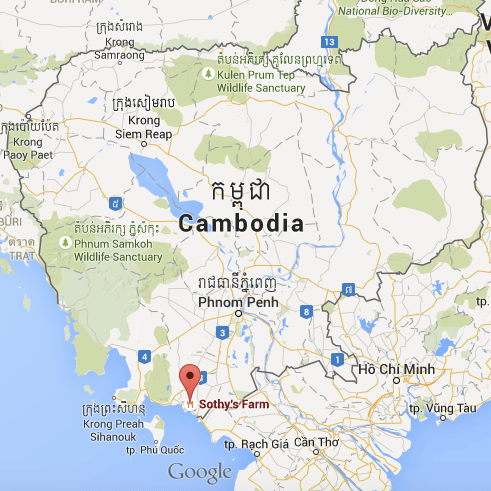 We reach Sothy’s Pepper Farm by tuk-tuk from the little coastal town of Kep. On the national road no. 33 towards the east, big signposts on the left hand-side of the road shows the way to a group of pepper plantations, a little bit more than 3.5 km further ahead, and here we are, at Sothy’s. The Farm covers around 3 hectares and has four pepper fields. 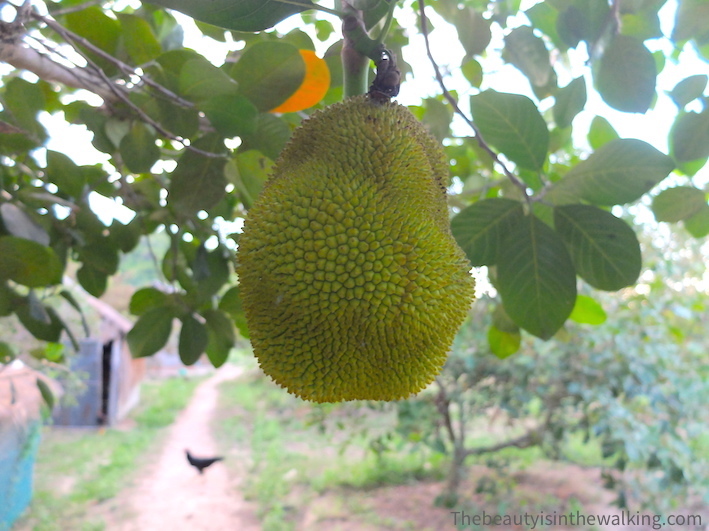 Besides, it also has several dozens of fruit trees – mangoes, durians, rambutans, and jack fruits – that delighted our palate during our stay. One of the pepper fields. All around wander about two grumpy geese, two couldn’t-give-a-damn cows, a tribe of chickens and chicks, a little crazy puppy, a lazy cat, a skinny cat, a singer gecko, big sour red ants, many little black fish, exhausting and inexhaustible mosquitoes, and… little kids (inexhaustible as well) with darn sweet faces. The children of Sothy’s Pepper Farm’s employees. 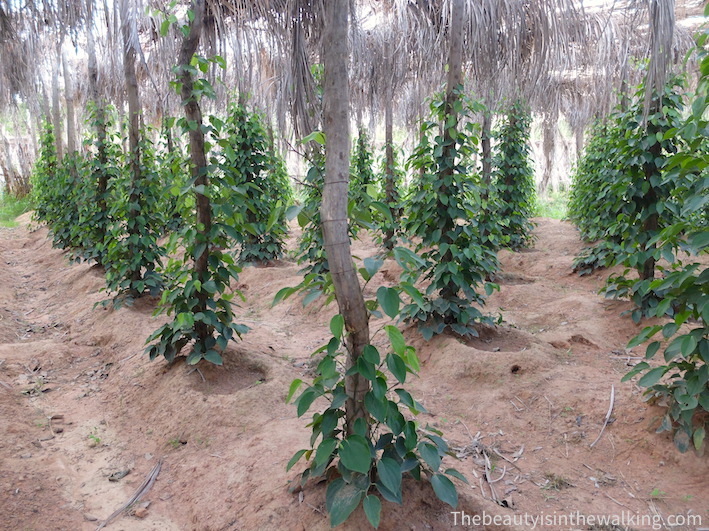 A pepper field is a succession of plants in rows; each of them grows up along a wooden pole. The pepper plant is a creeping plant – but it doesn’t naturally grow so –, it needs to be helped to climb up by fastening it to its pole. Each plant is « created » from two cuttings (two « pieces » of plant taken from a young one) planted directly into the ground; the roots will then be buried at the same place, just next to the wooden pole, to facilitate and optimize watering and fertilization. The field is well shaded with palm leaves, in such a way that the plants are protected from the sun. You have to know that a pepper plant gives fruits only from its 5th year. For the moment, the main field only, which has around 200 plants, can be harvested. Another one will produce pepper next season and two others are still in the state of nurseries. 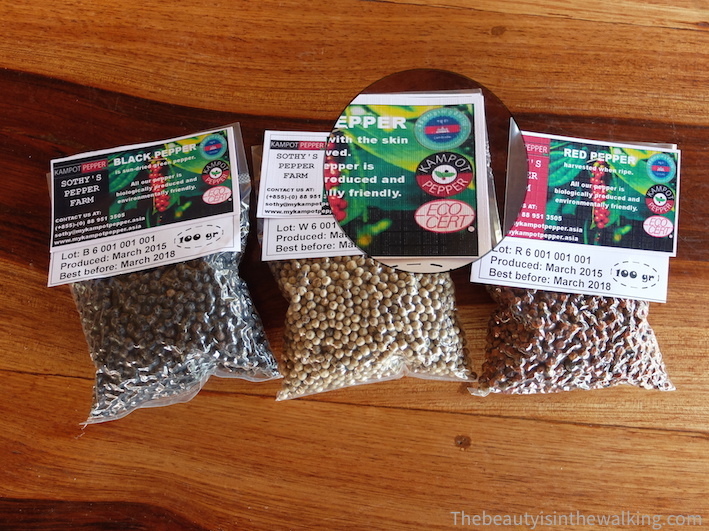 And already, the Farm produces 250 kg of black, red and white pepper; next year, its production will be doubled. 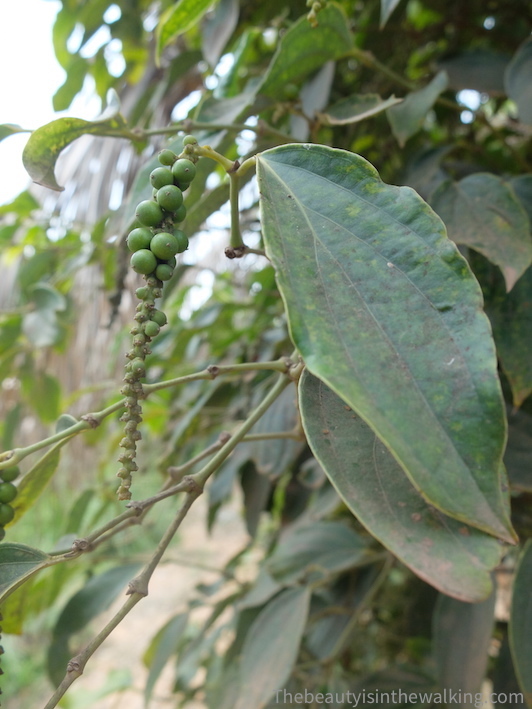 Since April 2nd, 2010, the Kampot pepper benefits from the status of Protected Geographical Indication (PGI), recognized by the World Trade Organization (WTO), which indicates products, whose characteristics are related to a specific geographical area. 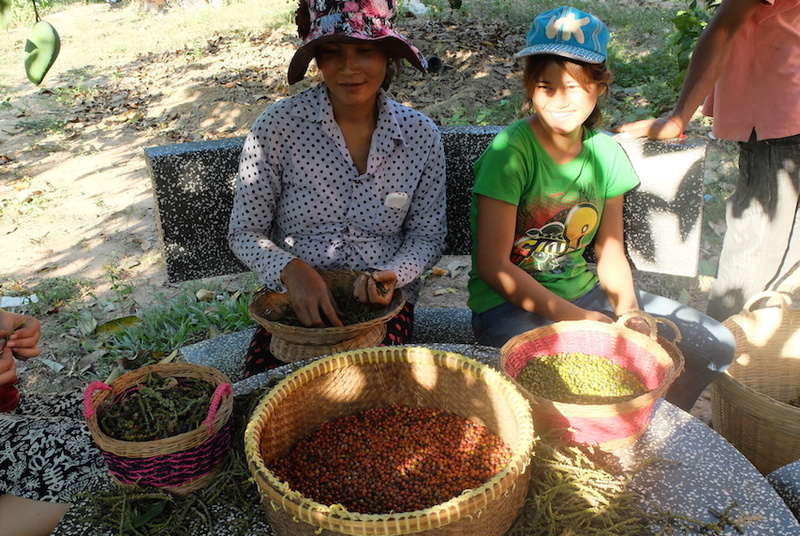 In the case of pepper, it is only produced in the Kampot and Kep provinces. It is the first certification of that type in Cambodia. 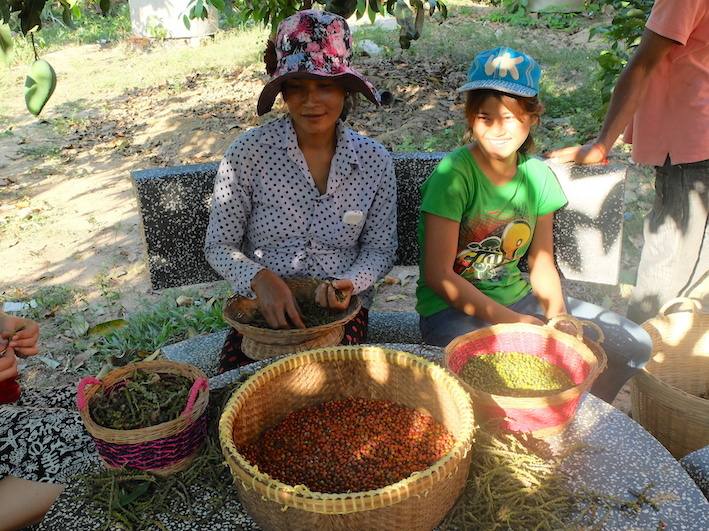 In all, 300 farms are authorized to produce Kampot pepper, and not less than 200 make organic farming! In shops, we recognize genuine Kampot pepper thanks to its three logos: the one of the PGI, the one of the Kampot Pepper Promotion Association (KPPA), not to forget the logo of the French certification, EcoCert. The three logos certifying that it is genuine Kampot pepper. In August – just after the rainy season –, stems will appear here and there on the pepper plant. Around September and October, they will blossom and the flowers will turn into small pepper corns until December. In January and February, these corns will get bigger until reaching their final size. From March, the beginning of the harvesting season, some corns will turn red, they will ripen. A pepper stem that has reached its final size. The harvesting takes place from March to May, knowing that at the beginning there will be more green corns, and overtime they will turn red. A stem ready to be harvested should have five to six red corns and a majority of green ones in order not to have any loss. If we wait longer, the first ripe corns will start to rot. 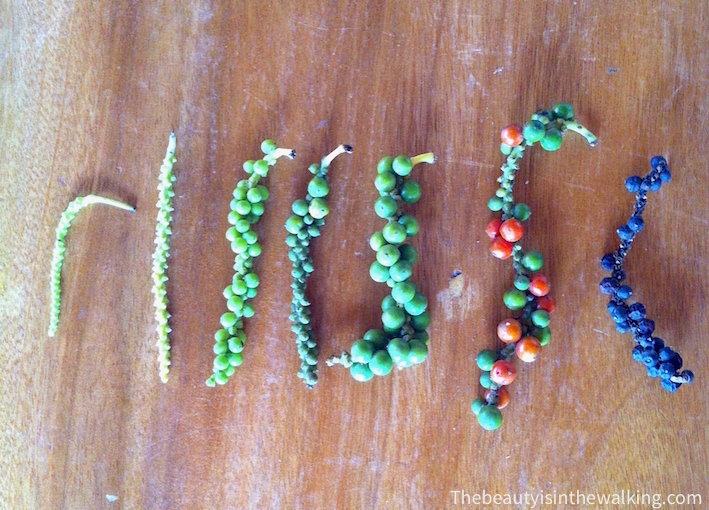 A pepper stem at different growing stages. Neither pesticide nor insecticide is being used at the Farm. We can testify that there are lots of creepy-crawlies everywhere; we have been true witnesses of that! It’s Noah’s Ark in the big water lily pots facing the main building. But yet, each of them has their own place. And for those that “raid” the pepper plantations, a clever mixture of leaves and seeds with a dissuasive smell is spread on the plants in order to keep away any unwanted creature. The fertilizer is also natural, you’re being told! Bat droppings from the cave “next door” will perfectly feed the pepper plants. The Farm is also completely autonomous in energy as it runs on solar panels and a wind turbine. This electrical equipment provides the energy needed to light the three buildings, and to operate the few useful devices – fridge, fan, computer, etc. – of the main building. 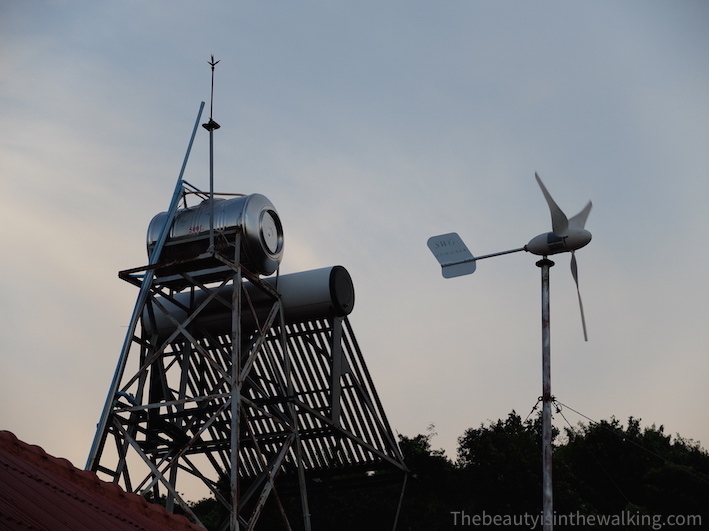 The Farm is autonomous in energy, thanks to solar panels and a wind turbine. Where does the pepper take its colours from? The different types of pepper come from the same plant. The black pepper is produced from the green corns, which will darken once they have been taken off their stem, and will be dried in the sun. The red pepper comes from the ripe corns, as well as… the white pepper! The production of red corns will then be divided into two piles before being processed differently to either make red pepper or white pepper. 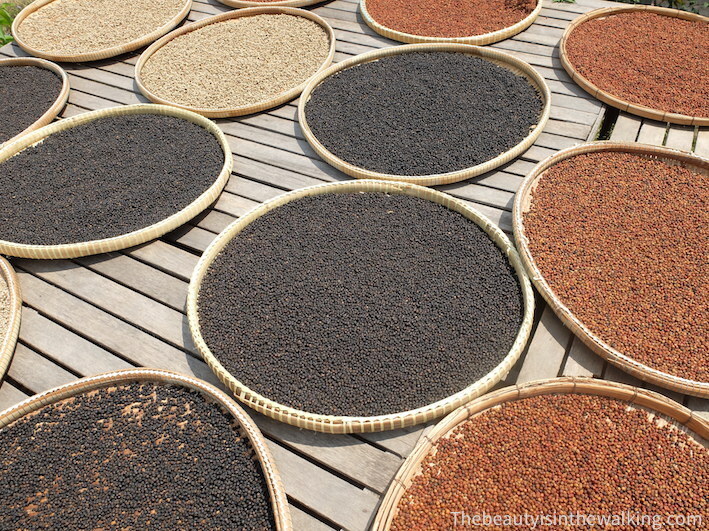 The red pepper will be directly dried in the sun, whereas to make white pepper, the red corns will be boiled beforehand to remove the skin and then dried in the sun. The pepper corns are only sun dried. And that’s it! Then we get three types of peppers which are quite different. The black one is the strongest, the red one is fruity and slightly sweet, and the white one has a more subtle flavour. In the restaurant of the Sothy’s Pepper Farm, we can read it’s “one of the finest peppers in the world”. But, you know, tasting is believing! How to cook Kampot pepper? The black pepper is the most widely used and multi-purpose. 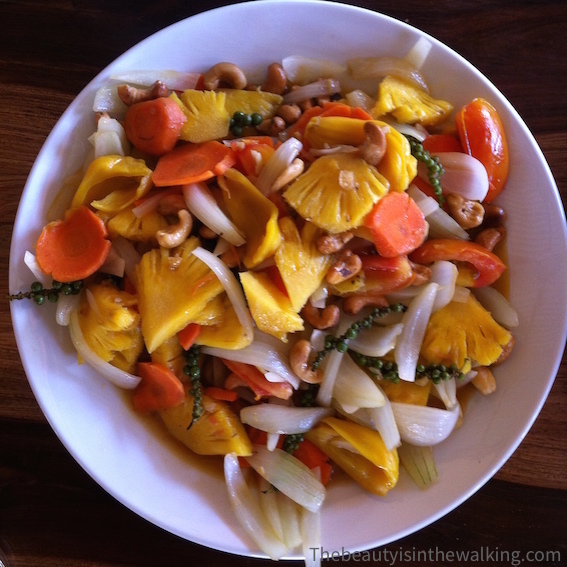 We can use it on a daily basis in all sorts of dishes. As for the red one, it is recommended to meat-eaters to go along with red meat – to be added half way through cooking, and not after, so that the maximum of the aroma can be released. It also a partner of choice with certain sweet dishes (see some ideas of recipes), and we can also recommend it in a sweet and savoury mixed salad, for example. And the white pepper would be perfect to perfume dishes in sauce and fishes. In the region, we also cook a lot fresh pepper (green pepper), however it is better to use it quickly after harvesting and it can be kept only four days. 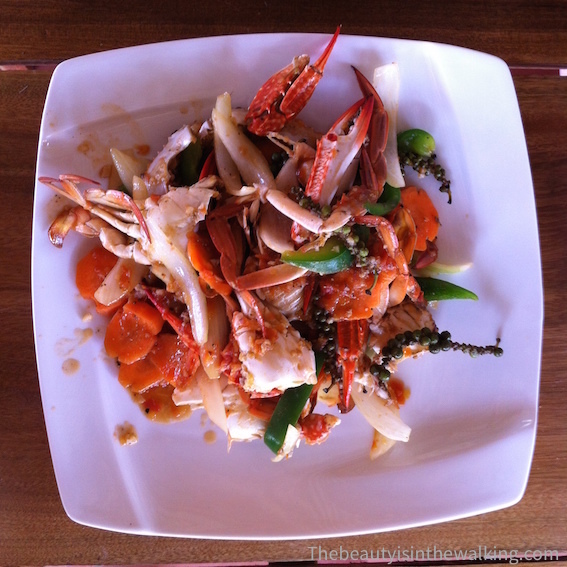 Crab with green Kampot pepper. By the way, we can make a funny parallel with wine. Not only regarding the use of the different colours of pepper for cooking, but also in the way that the plants grow. The grapevine and the pepper plant are both creepers and both like a fertile soil rich in minerals containing notably quartz. During these two weeks of volunteering, we did our best to bring our own contribution. So, we started with working in the pepper fields. Nothing beats it to understand how things work. The harvesting is from 7:00 to 9:00 am. We only harvest the stems that contain ripe corns. Then, as it is too hot, we go on with sorting the corns in the shade. You only have to make them roll between your thumb and forefinger so that they come off the stem, and you sort them according to their colour. It is a rather calming, soothing activity! The harvesting is done from 7:00 to 9:00 am. After harvesting, it’s time for sorting the corns, in a shaded place. Quickly, we were in charge of providing free guided tours to French visitors who came to the Farm. A pleasant activity, which enabled us to meet lots of travellers tourists and expatriates. The other two volunteers, Darren and Carlos, were in charge of the English and Spanish tours. Quickly, we provided free guided tours to French visitors. In addition to our everyday activities, we also made the French translation of the web site and created the Facebook page of the Farm. What did we gain from this experience? A lot and yet, it is quite hard to talk about it. Apart from the fact that we learnt a lot on the Kampot pepper, we lived a Khmer lifestyle – rising and sleeping with the sun –, worked together with the Cambodian workers – a dozen of them work everyday on the Farm during the harvesting season –, played tirelessly with the kids, ate the awesome dishes that Sothy cooked for us, met nice people with whom we spent great moments. We also ate some wonderful crab with green pepper while facing the sea, did a few end-of-the-day walks and rides in the surroundings, made a few strokes in the warm and comforting pool of the Vine Retreat, drank some Black Panther beer and danced traditional dances in a wedding where we were not invited, and cracked a few mirrors in the karaoke room where we spent an evening. So yes, of course, it is a bit frustrating not to have been able to speak with most of the Khmer people we met… However, Sothy was a wonderful vector of their culture, and thanks to her generosity and good level of English, we have been able to learn a lot. And this is finally the reason why we had decided to stop for a while. 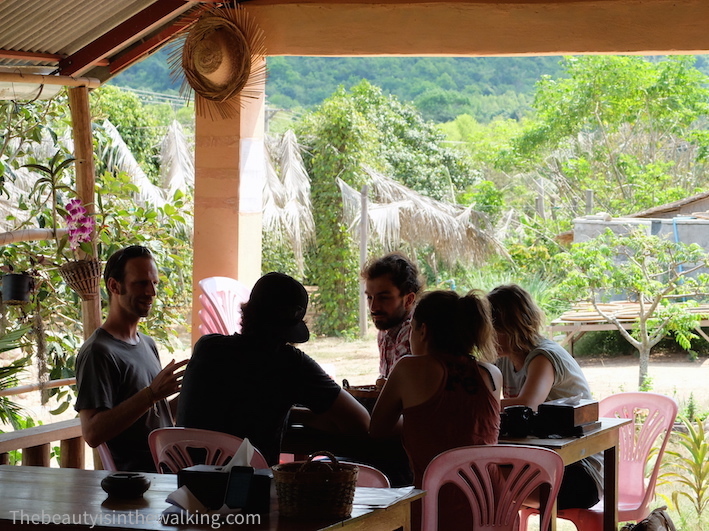 Us volunteers with Sothy, the owner of the Kampot pepper farm. Moi aussi, j’adore l’anglais no longer spend time on Google translate! Thanks so much, Ladies! Hope it’s not too bad. Great work with the English translation, good read ( just reliving the Kareoke ) photographs are a great reflection of the narrative, feels like your still here. Take care Erik and Ve. Hello Daz! Great to see you here! We hope that everything’s fine at the Farm. How is your veggie garden going? Say hello to the bloody geese for us. We think of you very often. Take care, Amigo!